Provides enough material for approx. 5 sq. ft. of installation coverage per tube. Mirror Glue is a state-of-the-art mirror adhesive specially formulated for sticking both conventional and acrylic mirrors to walls. Mirror Glue is chemically formulated from the highest quality mirror bonding solutions, giving you unsurpassed professional grade adhesion. No longer is a caulking-gun required to easily apply Mirror Glue to walls and mirrors. Just cut the tip and apply like paste! Works seamlessly with a wide variety of surfaces. 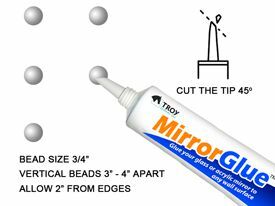 With Troy Systems' Mirror Glue, you can instantly install a mirror without the use of pesky screws and clips.